If a picture is worth a thousand words, is a view worth $695 a month? 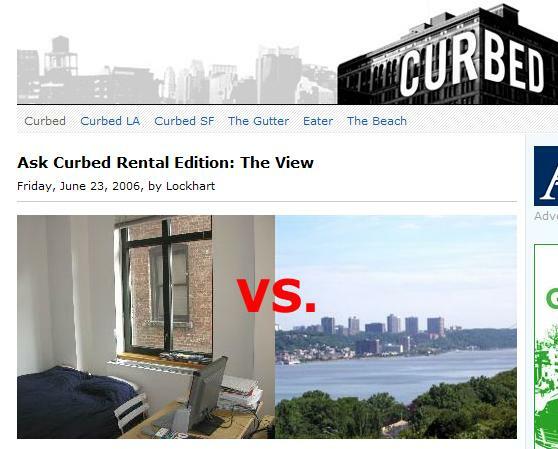 Check out this post at Curbed: the price difference between two almost identical apartments is $695 a month. The only difference between them is that one is on a higher floor and has a river view. I personally would not spend the money to live in either of these apartments, as I have no interest in living on the Upper West Side and they are way more than I can afford anyway. I've also never liked the idea of living in an elevator building. But I do like apartments with light. Actually even the cheaper one seems to get some sun, at least at the hour they took the photos, and not all of its windows look straight out at other windows. I would love to live somewhere that overlooked water, but I suspect I am more likely always to settle for an apartment that just looks out at the street or other people's backyards. I won't live in a place where I can only stare at a brick wall, even if it's a bargain, but I won't spend the extra money for a wide-open view either. I have lived in the same building in NJ for 8 years. The first had no view, the current one has a panoramic sweeping view of Manhattan from about 79th Street south clear on through to Staten Island, Hoboken... I also enjoy a massive terrace which literally can fit 40 + people (150 sq ft). I can tell you that a view is worth every penny, not only for purposes of resale, but also for purposes of its calming effect. There's nothing like having coffee on the terrace in the morning and watching the ferries, cruise ships, etc. Not to mention the fireworks. I have several friedns also with stunning high floor views who live in midtown and downtown. Again, so worth it. Its like having interactive, 24 hour art. I can honestly state, and this is not an overstatement, that I have one of the most beautiful views in the entire world. To me, its priceless. I suppose it partly depends on how much time one spends at home. That view is lovely, not just for the long horizon and water, but also for the trees. Also, it is extremely healthy for your eyes to look out at things that are far away. Especially for people who read a lot. "I don't understand why everybody doesn't want to live in Seattle,"